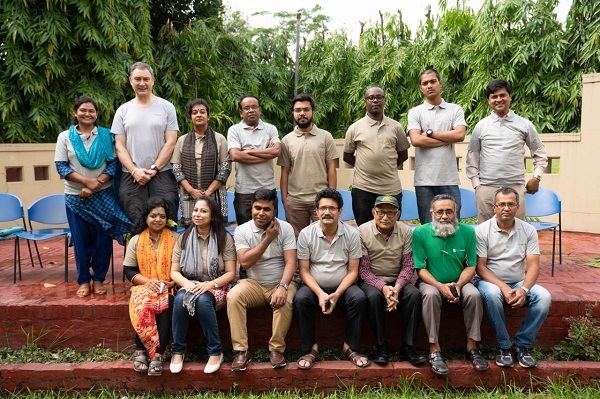 During an intensive video translation workshop in Bangladesh in May 2018, jointly organised by Access Agriculture and IRRI Bangladesh, 14 participants joined forces for five days to record Bangla voice overs and edit the audio of 50 existing videos hosted on the Access Agriculture video platform. The videos, featuring farmers from different countries, had all been selected by national agricultural experts as being relevant to their country. The video scripts had been translated in the four weeks leading up to the workshop by professional translators and finally verified by linguistic experts. During the workshop, professional translators, agriculture resource persons, video technical persons, national radio and TV journalists worked together in groups, supervised by Phil Malone and Kevin Mutonga – the Global Translation Co-ordinator of Access Agriculture. The teams ensured that the translations were done in conversational Bangla and that the delivery of the voice were in the style of a “farmer to farmer” video and not a news report. Five temporary studios were established at the training centre to capture the voices and the teams ensured both quality and timing. Harun Ar-Rashid, Country focus Bangladesh, and Rezaul Karim Siddique, a famous Agricultural TV producer, helped to resonate agricultural terms in the context of Bangladesh. The objectives of this workshop were twofold: to translate videos in an acceptable language to farmers and gather both content and technical people to understand each other’s perceptions. By translating relevant videos from various developing countries into national languages, such as Bangla, Access Agriculture is breaking down language and other cultural barriers in a true South-South approach, giving millions of farmers a quality learning experience. The new videos will be available on the website towards the end of June. In 2018 the number of languages in which videos are freely available on the Access Agriculture video portal has increased from 70 to 75. This workshop is only the end of the beginning. By making a large number of videos available in local languages, IRRI, its projects and partners, Access Agriculture and its partners, public and private sector service providers across countries are encouraged to make good use of them. This also helps strengthen the Bangladesh network for Access Agriculture.